There’s no way to know if it’s the three shimmering emerald cut gems on her finger or the look of love that gives her that radiant glow. 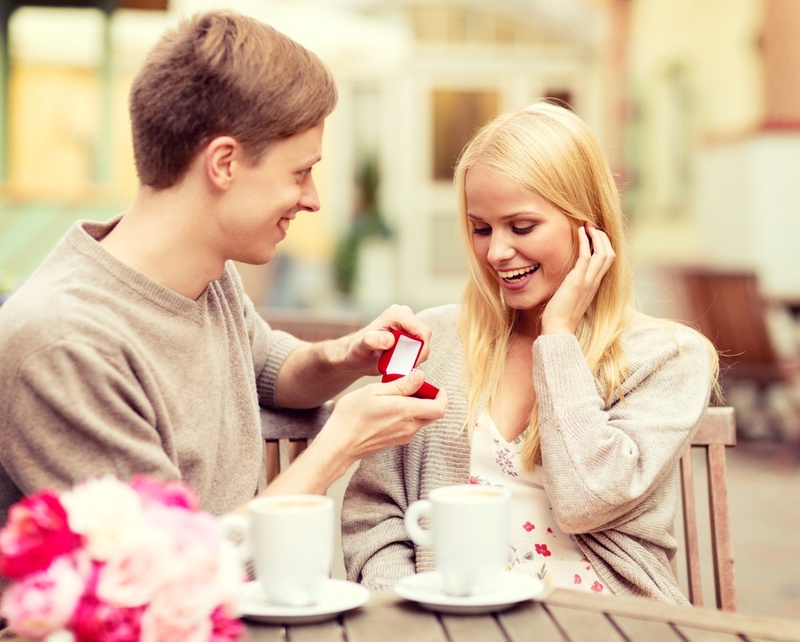 For the two aren’t mutually exclusive for this newly-engaged woman. She said ‘yes’ to the man and ‘yes, yes, yes’ to each of the three stones in the ring he gave her. 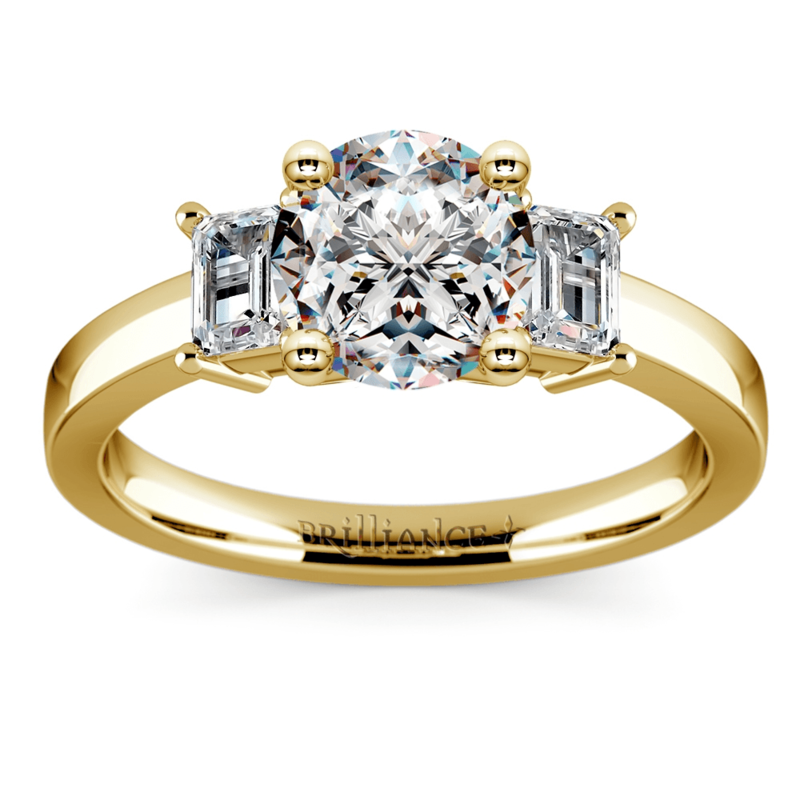 Also called trinity or trilogy rings, three-stone settings modernize the classic, solitaire diamond design. Three-stone settings are often arranged with equal sized gems; however, they can also be designed with a larger stone (the emerald cut) in the middle flanked by two smaller ones. As the name implies, the “emerald cut” was originally designed for emeralds, but it can also be applied with fantastic results to diamonds. An emerald cut refers to a stepped, rectangular cut with cropped corners. The open style of this cut symbolizes an open heart and personal clarity. Wearers have a strong sense of style which is matched by their strong self-worth and assurance. They know who they are and what they want. The bold bride-to-be sporting this dramatic and classy cut of diamond exudes confidence. Brilliance is known for our collection of breathtaking emerald diamond engagement rings, sold at incredible prices. Similar to a tattoo, engagement rings are usually worn for life, so it makes them that much more precious when the ring symbolizes the couple and tells the story of their love. The wearer is even able to tailor the symbolic meaning of the ring to correlate what values matter most to them. The most common meaning is for each stone to embody the past, present, and future of the couple’s relationship. This can be especially meaningful if the couple’s relationship has withstood the test of time, which is why three-stone rings are very common anniversary gifts. This symbolism is for the type of couple that could write a history book based on where their love has been, where it is now, and the many places they see it going. There are several other meanings for a trinity ring. Each stone can also stand for friendship, love, and fidelity. In addition to embodying the pair’s love and commitment, the three stones also represent the support the bride and groom-to-be’s love has from their friends and family. Furthermore, for a couple that practices Christianity, the three-stones can signify the Holy Trinity – the Father, Son, and Holy Spirit. The three-stone setting was originally given as an anniversary gift. With increasing popularity, it became a widespread choice as an engagement ring. There isn’t a wrong time to give a three-stone ring to your special someone; they are used to celebrate an engagement, wedding, or anniversary. In fact, the three-stone ring has expanded its list of recipients to include new parents and young adults who have just finished college. For new parents, the center stone represents the baby and the smaller stones on either side represent the parents. In the latter case, the three-stones can mean past (childhood), the present (adulthood), and the bright future prospects of the new graduate. A three-stone emerald cut engagement ring allows the wife-to-be the opportunity to personalize the look of her ring to make a romantic statement. Instead of just picking the biggest diamond in the store, the three stones and expressive cut allow a measure of creativity. Gems can be mixed to identify what is important to the couple. Whether symbolizing the past, present and future of the couple or time-honored values of friendship, love, and fidelity, like the jewel, the love is rare and everlasting and will last now and forever.